Duane Hackney was born on June 5, 1947, in Flint, Michigan. He enlisted in the U.S. Air Force on June 18, 1965, and was trained as a Pararescue Specialist. 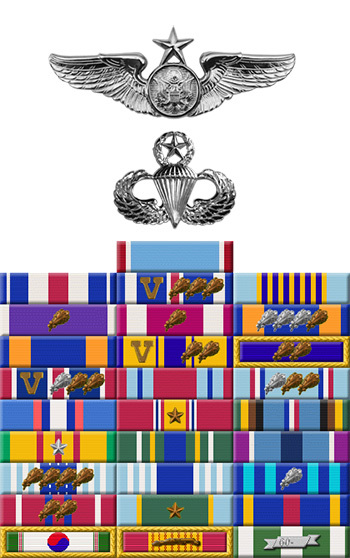 Hackney served in Vietnam from September 1966 to October 1967, during which time he aided in rescuing countless downed aircrew members and was awarded the Air Force Cross and the Cheney Award. He again served as a Pararescueman in Vietnam from 1970 to 1971. Duane left active duty in 1973 but returned in 1977 and served as an instructor in the Pararescue Training Course until he had a heart attack in 1981. He then cross-trained into Air Force Security Police and retired as First Sergeant of the 410th Security Police Squadron at K.I. Sawyer AFB, Michigan on June 30, 1991. Duane Hackney died of a heart attack at his home on September 3, 1993, at age 46. 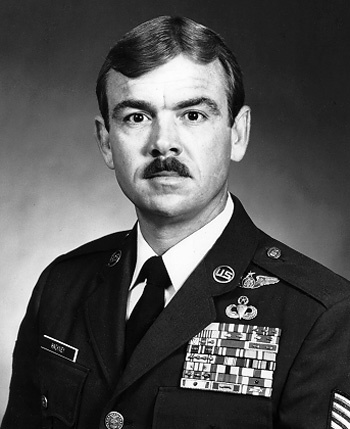 The President of the United States of America, authorized by Title 10, Section 8742, United States Code, awards the Air Force Cross to Airman Second Class Duane D. Hackney for extraordinary heroism in military operations against an opposing armed force as a Pararescueman on an unarmed HH-3E Rescue Helicopter near Mu Gia Pass, North Vietnam, on 6 February 1967. On that date, Airman Hackney flew two sorties in a heavily defended hostile area. On the first sortie, despite the presence of armed forces known to be hostile, entrenched in the vicinity, Airman Hackney volunteered to be lowered into the jungle to search for the survivor. He searched until the controlling Search and Rescue agency ordered an evacuation of the rescue crew. On the second sortie, Airman Hackney located the downed pilot, who was hoisted into the helicopter. As the rescue crew departed the area, intense and accurate 37MM flak tore into the helicopter amidship, causing extensive damage and a raging fire aboard the craft. With complete disregard for his own safety, Airman Hackney fitted his parachute to the rescued man. In this moment of impending disaster, Airman Hackney chose to place his responsibility to the survivor above his own life. The courageous Pararescueman located another parachute for himself and had just slipped his arms through the harness when a second 37MM round struck the crippled aircraft, sending it out of control. The force of the explosion blew Airman Hackney through the open cargo door and, though stunned, he managed to deploy the unbuckled parachute and make a successful landing. He was later recovered by a companion helicopter. Through his extraordinary heroism, superb airmanship, and aggressiveness in the face of the enemy, Airman Hackney reflected the highest credit upon himself and the United States Air Force.